Guess what? 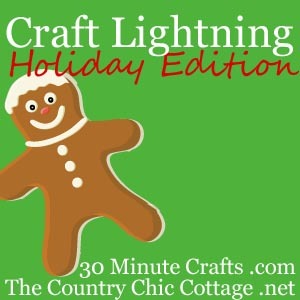 It’s time for another Craft Lightning! 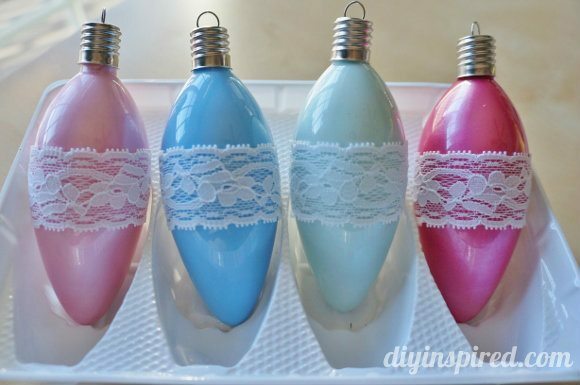 Today I am sharing how to make a Vintage Inspired Ornament in fifteen minutes. 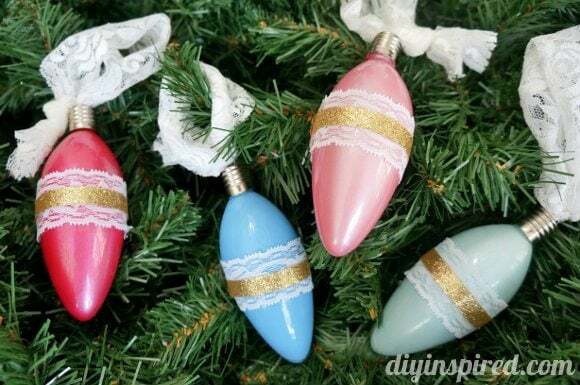 I wanted to make some more ornaments to match the vintage handkerchief ornaments I made the other day. 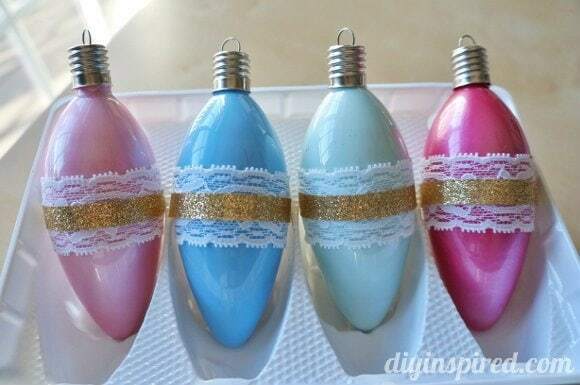 I started out with four oblong glass ornaments that I got on sale for 50% off…woo hoo! 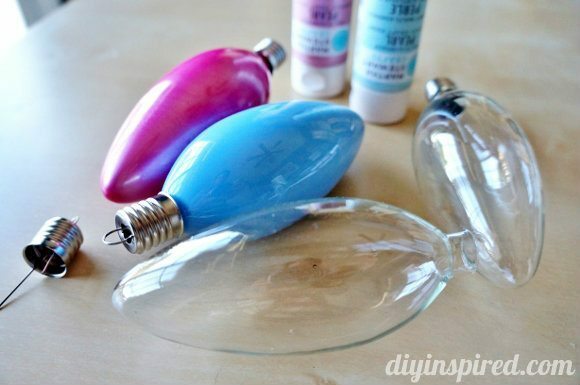 Remove the top and squirt a generous amount of craft paint into the bulb. 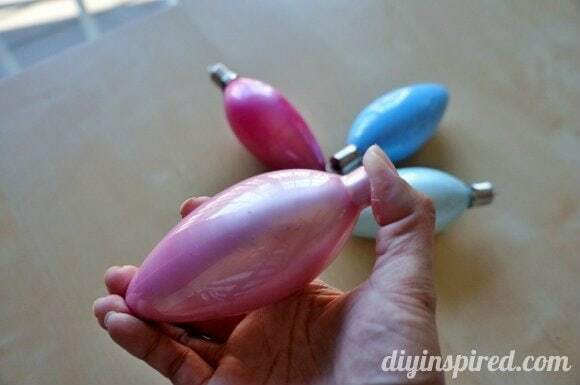 Place your thumb over the bulb and give it a vigorous shake. 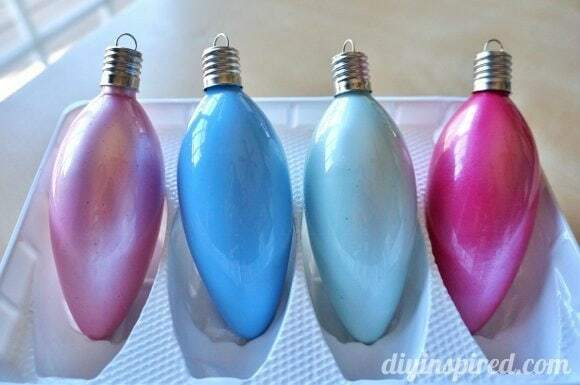 You may need to turn your bulb and shake to coat the entire inside. Keep a wet paper towel handy to clean your fingers. Place the top back on. You can wait for your paint to dry. I am too impatient, however so I didn’t! Ha! Next I cut a piece of lace ribbon. I hot glued the ribbon on with a thin strip at the back of the ornament. I also wanted a little gold sparkle, so I added a gold glitter ribbon on top of the lace. I also added a thicker lace ribbon as the hanger on top. They turned out quite nice! Your holiday bulbs are adorable and I’m wondering where you bought them? I have been looking for some oblong/teardrop shaped bulbs online and am not having much luck. Hi Stacey! Thank you! I bought them at Hobby Lobby.